If you’ve been looking for a truly discreet solution to crooked teeth, then your search ends here. 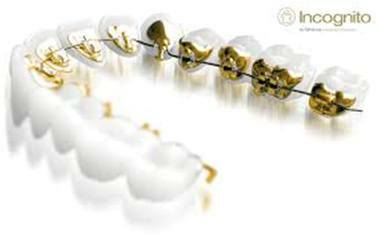 Incognito lingual braces feature individually crafted cast-gold brackets, which are fitted behind your teeth! So while strictly speaking they’re not invisible, they’re completely hidden from sight. Your friends and colleagues will have to try pretty hard to spot them. Incognito braces are great for treating mild to complex cases, including common problems such as crowded or crooked teeth; spacing; protruding teeth; and teeth that don’t bite together correctly. Treatment times vary patient-to-patient but moderate cases can usually be completed within 15 months, while more complex cases can take up to 24 months. As well as being ultra inconspicuous, Incognito braces are specially made, just for you. This ensures your brackets fit your teeth perfectly; resulting in maximum control and comfort. And because the braces are fitted behind your teeth, there’s no risk of decalcification and visible white spots on the front of your teeth by the end of your treatment. Because your brace is fixed to your teeth you won’t experience any delays to your treatment from not wearing your appliance. Will anyone be able to see my braces? The vast majority of your friends, family and colleagues will have no idea that you’re wearing a brace unless you tell them. However, although hidden, lingual braces aren’t invisible and if someone goes to the effort to look inside your mouth they might be able to spot your brace. Will the Incognito brace affect my speech? Some patients have no problems at all, but you might find that you have a slight lisp to begin with. To help your tongue adapt to your brace, we recommend reading the Rainbow Passage - a famous passage that provides a good sample of English sounds. Practice makes perfect! Incognito’s brackets have been carefully designed to hug your teeth closely, to minimise any potential discomfort. 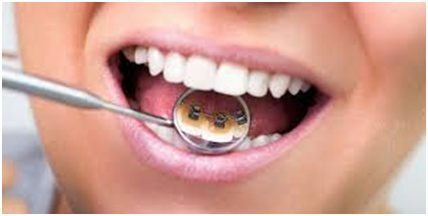 However, your tongue is very sensitive, so anything new in your mouth is going to feel a little strange at first, and you might find that initially your brace causes you some mild discomfort. To help with this we can give you some wax to cover any parts of your brace that are rubbing against your tongue.